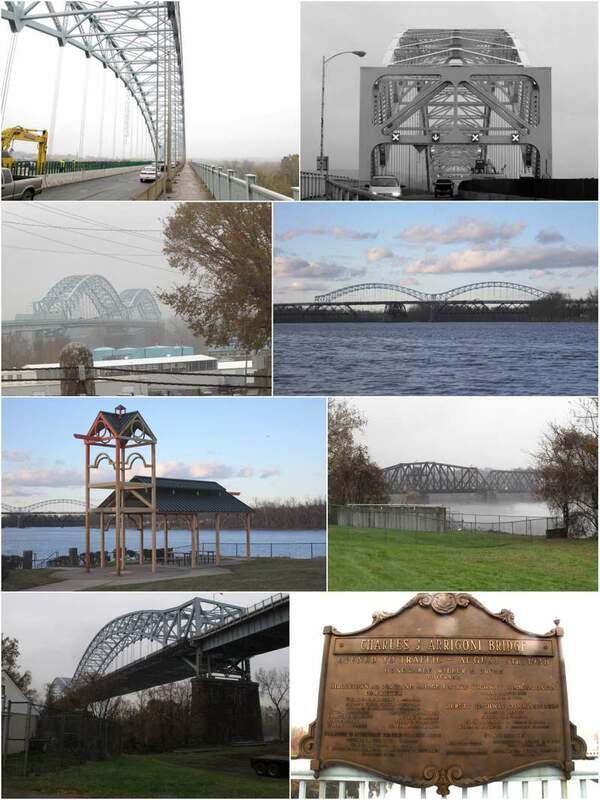 The Charles J. Arrigoni bridge takes routes 66 and 17 across the Connecticut River between Portland and Middletown. The plaque bolted to the bridge at the center point says that it was opened to traffic August 6, 1938. Honorable Wilbur L. Cross, Governor. She doesn't look bad for a 74 year old lady. I think this might be the most beautiful bridge that crosses the Connecticut in this state. The Bulkeley might be more historic, and the East Haddam bridge more mechanical, but neither beats the smooth sinuosity of the Arrigoni. I first crossed it on the way back from a visit to Gillette's Castle. I'd just gotten a car after being restricted to bicycle for two years. That's a story for another time. Anyway, I'm coming up route 9 and there's the bridge! And there it went. I had my grandson with me and we were heading back home for my own birthday party so I didn't stop then. It was raining when I went back, a light mist. I parked on Main Street and headed over the bridge on the pedestrian walkway. The eastbound lane was (and is as of last Saturday) closed for construction, so the shot I really wanted, of the Providence & Worcester Railroad swing bridge just south of the Arrigoni, I couldn't get. North of the bridge, an island separates the Connecticut in two for awhile. The east bank is the terminus for oil tankers and was off limits. The west bank looked residential. That would be the best place for a picture of the bridge. If I could figure out how to GET there. See, there is no direct connection between the Middletown downtown area and the residential area I needed to get to. But if you drive up 9 a bit, then come back down on the south lane, there's a hard-to-see sudden turn to the right that crosses some train tracks and there you are. Way too close to the base of the bridge. I crossed over to the Portland side of the bridge and passed the oil towers and came to a really nice park built to commemorate Portland's famed brownstone quarries. The island in the middle of the Connecticut hid the bridge from easy view (and plus, it was raining so visibility was low to begin with). The shot up above was out the passenger's window as I was driving back to Middletown from Portland. I parked at some state offices south of the Portland side and got some pictures beneath the bridge and of the P&W swing bridge. I was coming back up route 9 from photographing the East Haddam Swing Bridge and was wondering if there were any roads on hills I could park on and get a better broadside shot of both the Arrigoni and the railroad bridge. I didn't find any of those, but I did notice, going past, that there was a riverside park that should have great views of the bridge. And it did. It's a little tricky to get to, so I've embedded a map to the spot. I'm not a hundred percent happy with the shot. The way the railroad bridge is positioned, it looks like it might be some sort of support structure for the Arrigoni. It's not. It's not even that close to the bridge. When I go back -- there's some smaller footbridges in the area that I want to shoot -- I'm hoping the eastbound lane and pedestrian walkway will have opened. I would love to get on that island. Update: According to an article in the Middletown Press, the construction will be shifting to the middle two lanes of the Arrigoni at the end of January. February would be a good chance to get a picture of the railroad bridge from the Arrigoni.